Learning how to build a kite follows after how to make a kite. There are several reasons for this, the main one being that building a kite is a bit more technical and has more steps involved. If you are new to Airplane and Aircraft.com you will discover there are pages here on "making and flying paper airplanes". The next progression is "how to make a kite". Finally we arrive at "how to build a kite". Find exciting kites for adults and kids alike by clicking here - many bright colors, sizes and skill levels. Also available are many exquisite windsocks to hang and brighten up your day. If you wish take a few minutes next time you see someone flying their kite or grab one for yourself - you won't be disappointed. Kites are so much fun and so cheap to purchase also. It's not as though you need more secured loans to just buy yourself or a loved one a kite. They make a very good gift that you may not have thought of previously. They are an excellent way of enjoying the great outdoors. Okay. Let's learn how to build your tetrahedron kite. First of all we will learn how to build a series of small kites. Then we will join them all together and make one large kite. Ready? Good. STEP 1: Making a triangle. I read somewhere to use a large sewing needle for this first step however I just used one of the skewers. So attach your string to one of your skewers with some sticky tape. Then thread it through a drinking straw. Do the same with a second and third straw and tie them together to make your first triangle. It's important to keep your triangle tight but not so tight that it bends. STEP 2: Making a triangular prism. Now using two more straws make another triangle by attaching them to your first. 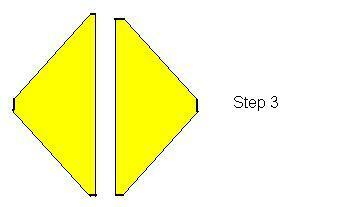 Then tie your last straw to your first triangle to make a triangular prism. That's now three new straws you have attached to your very first triangle. Right there you have the framework for your first small kite. Well done. Shall we build another one? I thought you would say yes. Now all you have to do is build three more small kites exactly the same way. STEP 3: Make and attach the sails. The next bit is a little bit tricky so take your time with it. It's now time to cut out the cellophane. You attach 2 pieces to each of the four triangular prisms. What I did was got myself a board and drew the outline of one of the triangles. 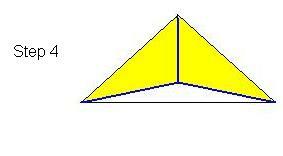 Then I got my ruler and measured 1/2" or 10mm bigger than the original and redrew the new triangle. Next step is to lay your cellophane onto the board and with a sharp knife cut out the shapes needed. If you are too young to be using a sharp knife then ask Dad or Mum or an adult to help you. You should finish with eight triangles. OK, now carefully attach the cellophane to two sides of your four prisms using the sticky tape. How is your tetrahedron kite looking so far? You must be getting excited - your kite is almost finished. You now have four small kites. Time to build four into one kite. Using your skewer with the string attached to it, attach all your kites together. There will be 3 kites on the base and one on top. Just make sure when you build them all together that the covered sides are all facing the same way. This ensure even flow of the wind through the kite. That is all there is to know on how to build a kite called the Tetrahedryl. If you wish you can make your kite bigger and better and stronger. The secret is to keep the same pattern that you have started. The Tetrahedryl requires a moderate wind to fly, so if today has a slight breeze you may have to wait for another day. But don't let that stop you from building this. Imagine how disappointed you will be when the wind comes and you didn't build your kite. Have fun with it, I know that I have. I know that learning how to build a kite may seem way too difficult. However as you have just seen for yourself building a kite is easy. Return from How to Build a Kite to Types of Kites.